Taxila is an archaeological site containing the ruins of the Gandhâran city of Takshashila, an important Vedic/Hindu and Buddhist centre of learning from the 6th century BCE to the 5th century CE. Historically, Taxila lay at the crossroads of three major trade routes: the royal highway from Pâṭaliputra; the north-western route through Bactria, Kâpiúa, and Puṣkalâvatî (Peshawar); and the route from Kashmir and Central Asia, via Úrinigar, Mânsehrâ, and the Haripur valley across the Khunjerab pass to the Silk Road. Taxila is one of those archaeological sites which seem to have a bit of everything - remains of different cultures from Mesolithic to Mediaeval encompassing Buddhism, Hinduism, Zoroastrianism, Islam and Christianity, connections with Alexander the Great and the Silk Road and a great story of late 19th and early 20th century archaeology. It is not a single excavated city but a whole series of remains spread out across the Taxila valley around 30kms NW of Islamabad just where the foothills of the Himalaya begin to become really noticeable. This location put it literally at a “cross roads” of 3 trading routes. In terms of what there is for the average interested person to view, these relate primarily to the period between 2nd C BC and 4th C AD focussed on a Buddhist culture known as Gandharan. There are at least 50 different sites in the valley, of which 18 have been given ID numbers by UNESCO so you will need to choose between these taking into account your available time, means of transport and interests! There is also a fine museum which needs to be fitted in, both for what it has on show and for its early 20th C ambiance with high wooden ceilings, wonderful glass cabinets, brass fittings and leather chairs! It is also something of a shrine to Sir John Marshall who spent some 20 years excavating at Taxila, initiated its construction and whose office is still on show. My recommendation would be to go to the museum before going out to the sites (Say 45 minutes to 1 hour) but also try to revisit on your return. It contains a useful 3D model of the valley and rebuilt stupas, both of which will help make sense of what you will see. The individual sites can be divided into Towns/Cities and Monasteries/Temples and you should certainly aim to take in at least one of each - and this even if you have been or are going to the WHS monastery of Takht e-bahi situated another 130kms towards Afghanistan. By the way, although it might just about be possible, and would seem to avoid the need to do the trip out to Taxila twice if you are centred on Islambad/Rawalpindi (We did this to avoid visiting/staying at the currently potentially more dangerous town of Peshawar for which, as of Dec 2013, the UKFO has a “No travel” advisory issued), I would NOT consider trying to cover both sites in a single day. We visited Sirkap “city”, together with Jaulian and Dhamarajika monasteries and, from what I saw/read, the first 2 are pretty “essential” viewing, with anything else being fitted in according to time and inclination. Dharamajika was 2.5kms East of the museum in the “wrong” direction as there are other sites near the road out NE to both Sirkap/Jaulian but it still seemed the next most significant monastery after Jaulian (which was our furthest point around 7kms from the museum) – there is a footpath from it to Sirkap which could be a pleasant way of making a circuit. Our guide was a bit upset that Pakistan has recently introduced a separate entrance fee for each site whereas they all used to be on 1 ticket (the Museum has always been extra). Whether the $2 fee pp will alter your view on how many sites you visit is up to you! Seeing these 3 sites and the museum (twice) pretty thoroughly with a car took us around 5 hours. Jaulian Stupa and monastery are described in Isobel Shaw’s guide as “the best preserved buildings at Taxila, and the only ones in Pakistan that give you some idea of what the original decoration round a stupa was like. A roof protects the plaster statues… and the site is guarded day and night”. The site is situated on a hill (rather like, but not as high as, Takht-i-bahi). Although it is pleasant to walk around the various buildings, courtyards, monks cells etc, it is absolutely essential to get the chowkidar to open the gates to the caged covered area (he will want a tip for doing so!) so you can get close up to the stupas and examine the details of the art work. The reason for the protection is that these are all made of stucco rather than stone so, once uncovered, they needed to be protected. In some cases a notice indicates that the stupa or Buddha statue at that location had been removed to the museum (sometimes replaced by a copy). It is rather difficult to imagine what it might all have looked like when fully plastered, gilded and in use for rituals - I used Myanmar’s Shwe Dagon as my reference point! At this point what you might have seen in the museum becomes of use as it enables you to imagine the full stupa with its canopy of stone umbrellas (Photo). Dharamajika is another Stupa and Monastery complex – its particular aspect is that it is the oldest in Pakistan, going back to 3rd C BC when Ashoka built the orginal stupa supposedly containing some of the ashes of the Buddha. Over the centuries it was enlarged and a monastery grew around it – the visible remains cover a period up to 5th C AD. There isn’t a lot of art work on display as most of what was discovered is in the museum but it is a pleasant site to wonder around in a countryside setting and isn’t over restored or “regulated”. So, Taxila needs a bit of time and effort, both physical and mental, to make sense of. Its values are not obvious and in-your-face, but we enjoyed our visit. This report by Global Heritage Fund (GHF) contains detailed photos of the 3 sites we visited and background on the history and condition as of around 2006 - http://ghn.globalheritagefund.com/uploads/documents/document_1969.pdf . But the situation hasn’t improved. And it could just be a matter of time before this site also gets considered for placing on the UNESCO “In danger” list. In May 2012 GHF placed it on its own list of the top 10 most endangered sites in Asia. I've visited Taxila twice in May 2004; the site can easily be reached from the Grand Trunk Road, which connects Islamabad and Peshawar. 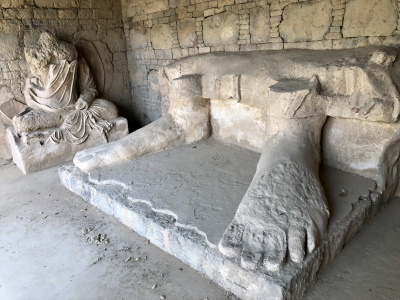 There are several subsites at Taxila, such as Bhir Mound (the oldest part), Sirkap and Sirsukh (two later cities), a giant stupa, a Greek-style temple (called Jandial) and several Buddhist monasteries. A bicycle or a rented taxi can be useful, because the distances between these parts of Taxila are pretty large. At all these sites, it is easy to hire an English-speaking guide, but I was not always impressed by their quality. Hindu Sites in non Hindu countries: The remains of a Hindu temple exist at Sirkap. The entire site is described as "containing the ruins of the Gandh?ran city of Takshashila, an important Vedic/Hindu .... centre"